This interesting and unusual surname is of early medieval English origin, and is a patronymic form of Hammer, i.e., "son of Hammer", which has two possible sources. Firstly, it may be a metonymic occupational name for a maker or user of hammers, for example one who worked in a forge, from the Middle High German "hamer", hammer, from the Old High German "hamar", stone; hence, "hammer made of stone". Job-descriptive surnames originally denoted the actual occupation of the namebearer, and later became hereditary. Secondly, it was given as a nickname to a forceful person, from the same derivation as above. The creation of surnames from nicknames was a common practice in the Middle Ages, and many modern-day surnames derive from medieval nicknames referring to personal characteristics. John le Hammer is noted in the 1332 Pipe Rolls of Sussex, but the patronymic form is not listed until much later on (see below). 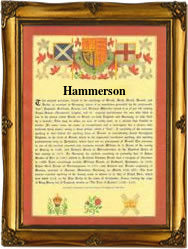 In the modern idiom the surname can be found as Hamerson and Hammerson. On June 29th 1634, William, son of William and Ann Hamerson, was christened at St. Bride's, Fleet Street, London, and Mary and James, the twin children of James and Elizabeth Hammerson, were christened at St. Dunstan's, Stepney, London. The first recorded spelling of the family name is shown to be that of William Hammerson, which was dated April 8th 1599, witness at the christening of his daughter, Alice, at Frampton, Lincolnshire, during the reign of Queen Elizabeth 1, known as "Good Queen Bess", 1558 - 1603. Surnames became necessary when governments introduced personal taxation. In England this was known as Poll Tax. Throughout the centuries, surnames in every country have continued to "develop" often leading to astonishing variants of the original spelling.